Image courtesy Artistic Puppy Creative. ANCHORAGE: B concourse nursery (just beyond the junction to B and C concourses, near the "Big Moose"); midway down the B concourse; C concourse near gate C 9; A concourse near Ticketing; A concourse near Ravn Alaska gates; A concourse near PenAir/Grant Aviation gates. FAIRBANKS: Regional concourse on lower level; behind security near Gate 1, upper level. JUNEAU: Main gate waiting area, upper level. KETCHIKAN: Main gate waiting area, behind security. VALEDZ: Departure area, near Ravn Alaska gates. KENAI: (Spring, 2019) Airport currently under renovation. 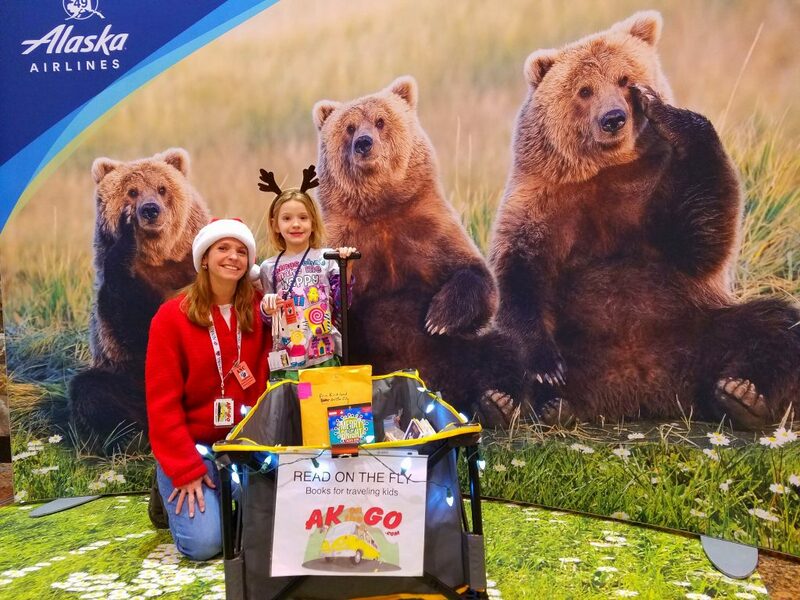 With the support of airport officials, Ravn Alaska, Alaska Airlines, and fiscal sponsorship through Best Beginnings Alaska; and a number of individual and business partnerships, Read On the Fly is distributing approximately 200 books a week to children traveling through Alaska's airports, encouraging young people and their caregivers to pick up a book instead of an electronic device. 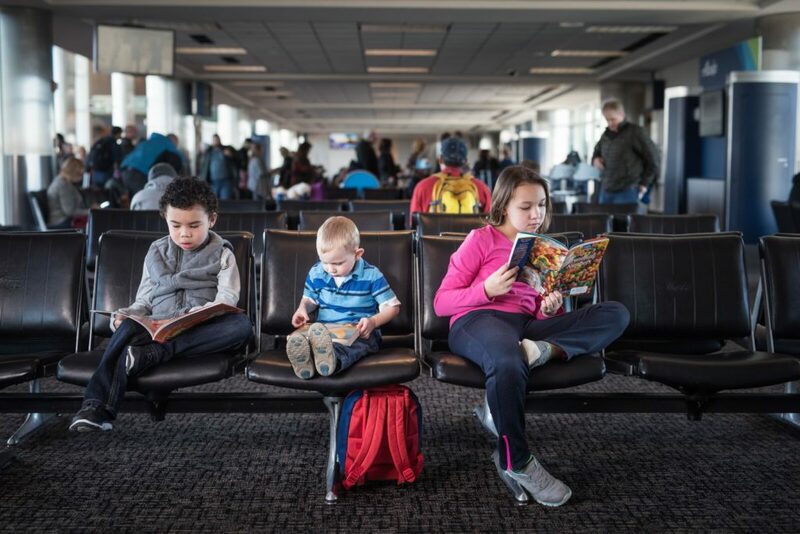 Read On the Fly works with a simple premise: get kids reading while waiting for flights, during flights, and long after their journey. Better still, for families who don't often read together, books and cozy reading spaces near Read On the Fly sites will offer peaceful respite from the busy hustle and bustle of travel, especially for families traveling between rural areas or overseas. In short, children will have the opportunity to read, and that creates more conversation, critical thinking skills, and improvement of vocabulary. How does Read On the Fly work? All books provided for the project are donated; books must be in good condition and will vetted by Read On the Fly volunteers. Bookshelves in the reading areas are stocked on a regular basis and children may choose to pick out a book to read while waiting for a flight, or select one book to take on their journey. Operating similarly to the "take a book-leave a book" shelves found in many hotels or restaurants, Read On the Fly shelves will contain books for kids 0-18. Can I help? YES! Donate a book for children 0-16, volunteer to pick up books from our three drop-off sites (listed below) or help classify, mark, and load books for distribution. Books should be in good condition and appropriate in content. Do you accept monetary donations? 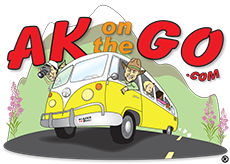 As of January 1, 2017 Read On the Fly has the support of Best Beginnings Alaska as fiscal sponsoring agency. This means the project will be able to apply for grant funding, host fundraising events, and receive individual and business donations in addition to our books generously given to the program. 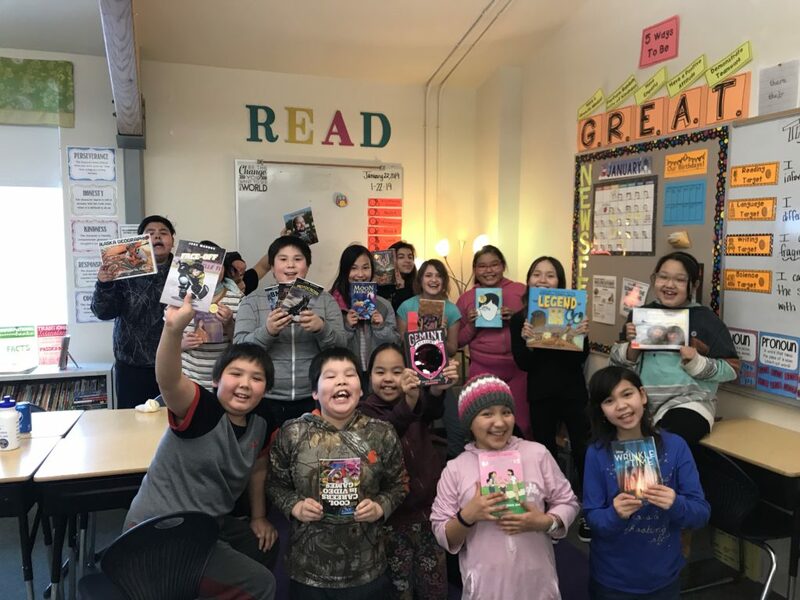 Bethel students enjoy their community outreach through Read On the Fly. It is hoped that this project will continue to grow; reading a good book can open doors of imagination and mystery, fact and inspiration. All kids need are tools to help shape their futures. 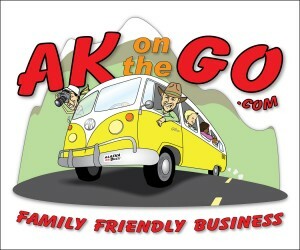 To contact AKontheGO publisher and avid reader Erin Kirkland directly, send an email to e.kirkland0@gmail.com. Also consider supporting our Facebook page to keep up with the latest in book-themed information and moments of joy. 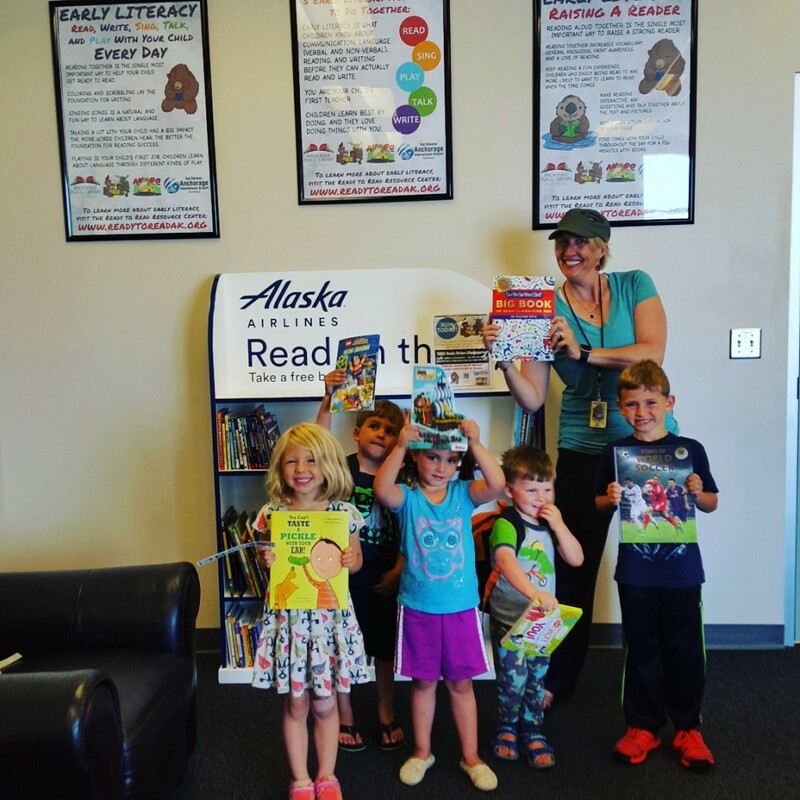 Thank you to the following individuals and companies who have offered services, books, and hours of time toward this important project to benefit the kids of Alaska and beyond. Do you have pick up services for the valley? Thanks! what about…. Coloring Pages about the Intertidal Zone?!!! !